Chinchilla Rescue | Forever Fiesty Chinchilla Rescue | Are You Right for a Chinchilla? The real question is.....Are YOU right for a Chinchilla? Things to consider before you make the commitment. So often people ask if a chinchilla would be right for them, when the question should really be; are YOU right for a chinchilla? One of the most frequently asked questions I get when people hear about how many surrenders we are asked to take is, 'why do people want to give up their chinchillas'? The most common reason people give is, "I don't have time for him anymore or he deserves more attention than I can give him", which is basically the same reason. People's lives change, they lose interest in him, they get new jobs, move, have babies, go to college, and develop allergies. All of these reasons are why people stop spending time with their chinchilla and find themselves just feeding and cleaning him and not much else. Then, the cleaning, feeding and space the cage is taking up just gets to be too much. Many people recognize that this is not fair to the chinchilla and want to find a home where he will get proper attention and play time that he deserves. Before you think about getting a chinchilla, I want you to understand that they are a lot of work and a serious commitment. Of course this qualifies for all animals, but for some reason many people seem to think that living with a chinchilla is going to be easy. I think this is greatly perpetuated by the pet store industry and backyard breeders. When I speak with people about chinchillas, I tell them how wonderful, social, playful, intelligent and loving these animals are. However, I also tell people what a long term commitment they are. That they are hyper and usually don't like to be held for any length of time, that they are messy, how it takes time for most chinchillas to get to know you and that they can live 15-20 years among other facts. These animals are so wonderful and I adore them and others in the chinchilla community are just as chinchilla crazy as I am, but just because you love animals and chinchillas are so cute and furry does not mean a chinchilla is good for you. They are unlike any other animal when it comes to personality and many people find that they are very disappointed after getting a chinchilla because they put expectations on these critters that they simply can't live up to. You will not change a chinchilla no matter how much you want to. These animals will not flourish in a home where they don't have proper housing, healthy diet, toys or proper attention and play time. You, as a chinchilla parent really need to structure a part of your day around your chinchilla. They are not independent animals and unlike many small critters, chinchillas potentially can live a very long time. So please consider a few things before bringing a chinchilla into your home. 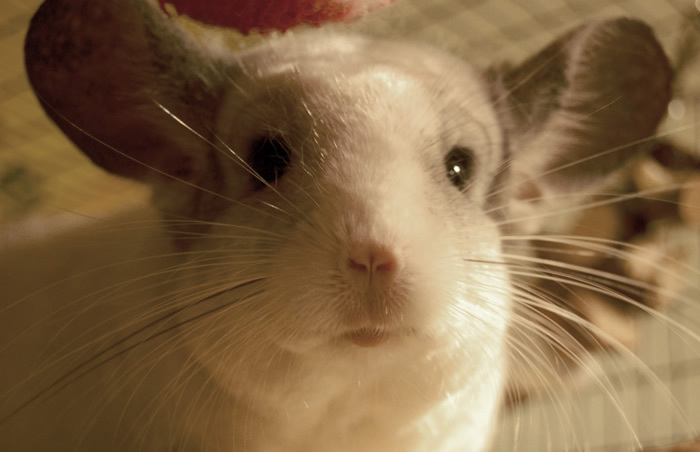 Chinchillas are NOT 'hypoallergenic,' meaning allergy free. I don't know how this rumor got started, but it is simply not true. Many people are allergic to the dust the chin needs to bathe in and the hay they need to eat. Some people are even allergic to some bedding. I have known people who develop allergies they did not even know they had. If you have asthma a chin may cause serious health issues for you. Are you allowed to have a chinchilla where you live? If you rent, a chinchilla may not be the best companion for you. People are always contacting me saying they can't keep their chins because it is against the rules. When you move, finding a new place that will allow a chinchilla is very difficult. Chinchillas are exotic animals. They tend to be hyper and sensitive and will not just sit in your lap to be petted. They are also very fragile under all that fur and because of this; we do not recommend chinchillas for young children (under 13 years). Many kids will inadvertently handle the chin roughly and many get bored after having them for a short period because they won't stay still or the novelty wears off. This is extremely common! So even though your child may beg for a chin, it is rare that the interest or commitment lasts very long once you get one. Chinchillas can not tolerate heat or humidity at all so having an air conditioner is a must. Fans do not work to cool a chinchilla because chinchillas do not sweat and a fan just blows room temperature air. The room temperature should not exceed 70° with humidity no higher than 65%. The perfect temperature for a chinchilla is between 55°-65°. They can literally die of heat stroke. Are you ok with paying higher electric bills in the warmer months because the air conditioner needs to be on for the chinchilla all day and night? Chinchillas are very active and need a good size cage to live in. The minimum cage size should be 36"h x 30"w x 18"d for a single chinchilla. Of course a larger cage would be great and needed if you have more than one chinchilla. Do you have the room for a cage this size? Rabbit, guinea pig and some ferret cages are not safe cages for chinchillas. The bar spacing should not exceed 1". Chinchillas need to take a dust bath 2-3 times a week. This creates a fine layer of dust on anything surrounding the cage and in the air. Once again, many people have allergies to this so please keep this in mind. Chinchillas are messy! You will have hay, poops and bedding outside the cage constantly, it is impossible not to. Most people just keep a broom and dustpan handy. Chinchillas are indoor companions only! Do NOT keep your chin outside. If you live with other animal companions, will they be ok with a chin in your home? You don't want to put a chin in danger with another animal that may try to attack or stalk him when he is in his cage. You will need to plan on play time and a play area outside of the cage for your chinchilla. This means setting up a safe, chin-proof area. Chinchillas chew everything and will test chew most things they come in contact with. This includes electrical wires, plastic, painted/stained woodwork. You will need to cover or move wires and anything that your chinchilla can get hurt with. You should never leave a chinchilla unsupervised when playing outside of his cage. Chinchillas can have a lifespan of 15 - 20 years!! The oldest chins we had living here were 21 years old. Are you prepared for the commitment? This is a big consideration when getting a chinchilla for a younger person who will be leaving home for college or moving out some day. College is not an appropriate place for chinchillas. Are parents willing to keep the chinchilla? You will also need to know of an exotic veterinarian that has knowledge of chinchillas in case your chinchilla should need medical care. Many vets do not have proper knowledge to see a chinchilla so you need to do your research and find a vet before considering bringing a chinchilla into your home. Vet visits are very costly for exotics. Just for an appointment without any medication or treatments usual starts at $50.00 and goes up from there. Are you prepared to pay for costly vet bills should they be needed? The startup cost to get a chinchilla and all the needed supplies can easily cost you from $280.00-$400.00. Then there are the ongoing expenses of food, hay, safe chew toys and accessories for the cage. People give up their chinchillas for many reasons such as: They don't have time for him any more ~ The kids got bored with him ~ We are expecting a baby ~ We are moving and they won't allow pets ~ Got a new job and are too busy ~ Allergies/Asthma ~ He is too messy ~ I can't pick up or hold him ~ Going to college ~ The chin got sick and I don't have the money to pay the vet ~ I put a male and female together and now I have five chins I can't take care of ~ Getting a divorce ~ The chin is harassed by the dog or is being replaced by a new dog ~ He was a spontaneous buy at a pet store and I made a mistake. These little critters are very special and they require very specific care. They are very social IF you spend time with them. They like routine and people who are home a lot. They depend on you fully. So ask yourself; do I really have the time, commitment and budget that a chinchilla deserves and needs?